On Monday Nov. 12, Delaware City Council approved plans for the Wesleyan Inn, an new hotel near the Ohio Wesleyan campus on West William Street. The plans involve renovating the historic Perkins House that will serve as the front half of the hotel. 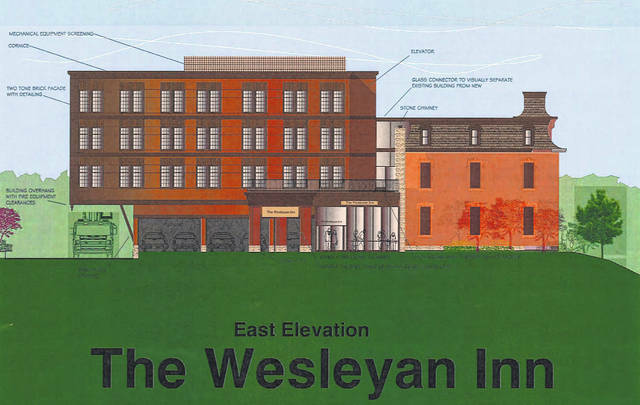 Pictured is an east elevation rendering of the Wesleyan Inn. In September, after having his original proposal denied by Delaware City Council, developer Jim Manos detailed plans to restructure his proposal for a hotel to be built as an addition to a renovated Perkins home. At Monday’s (Nov. 12) council meeting, those plans were approved by a unanimous vote. Under the original proposal, Manos was going to build a three-story, 43-room hotel as an addition to the historic Perkins House, located at 235 W. William St. As part of the development, Manos had purchased and planned to tear down the house existing immediately west of the Perkins home to make way for the hotel’s parking lot. The parcel of land in which the house sits, zoned residential, proved to be the ultimate impasse for some council members who did not support rezoning the residential parcel for commercial use. While council members would not allow for the rezoning of the parcel that would have been the parking lot, which doomed the entire project, the sentiment of the council was that there was no issue with the idea of the hotel, itself. With that, Manos resubmitted a proposal that, by and large, represents his original vision for the hotel. To appease the previous concerns of council members, Manos will raise the three-story hotel with brick supports to allow for parking spaces to be included underneath the building. The ground-level spaces underneath the hotel will accommodate 11 cars and eliminates the need for the parking lot on the west side of the building. Most of the remainder of the parking will be located on the east side of the building, as well as behind the hotel. With the raising of the building, the hotel will stand at 51 feet tall. Manos will still demolish the home immediately west of the hotel, and the preliminary development plan shows intent for the area to be made into an open lawn space, landscaped with trees with a privacy fence included, to serve as a buffer between the hotel and the residential neighborhood. A turn lane into the hotel will be added on William Street, but there will be no changes or reduction to the on-street parking around the hotel. Parking and the potential for curb cuts had been a top concern for neighborhood residents. Manos’ excitement and readiness to begin construction on the hotel has been apparent since his original proposal passed through council, and that excitement was on further display Monday. Before addressing council on the preliminary development plan, Manos, who first entered into a contract to purchase the Perkins home in the summer of 2017, took the opportunity to show off several pieces of unique Delaware memorabilia he has acquired to put in the hotel since then. Included in the collection he displayed was the 1948 Little Brown Jug trophy and a vintage OWU basketball uniform. Several people voiced their support for Manos and his proposal as part of the public hearing portion of the meeting. David DiStefano, who owns the SMOHKED and 12 West restaurants on William Street, cited his experiences with Manos as fellow business owners in downtown Delaware in backing Manos. After the meeting, Manos said he hopes to finish up the final development plan process as soon as possible. He is hoping to break ground on the hotel this Spring.